San Francisco City Hall is an easy place to have your wedding ceremony. 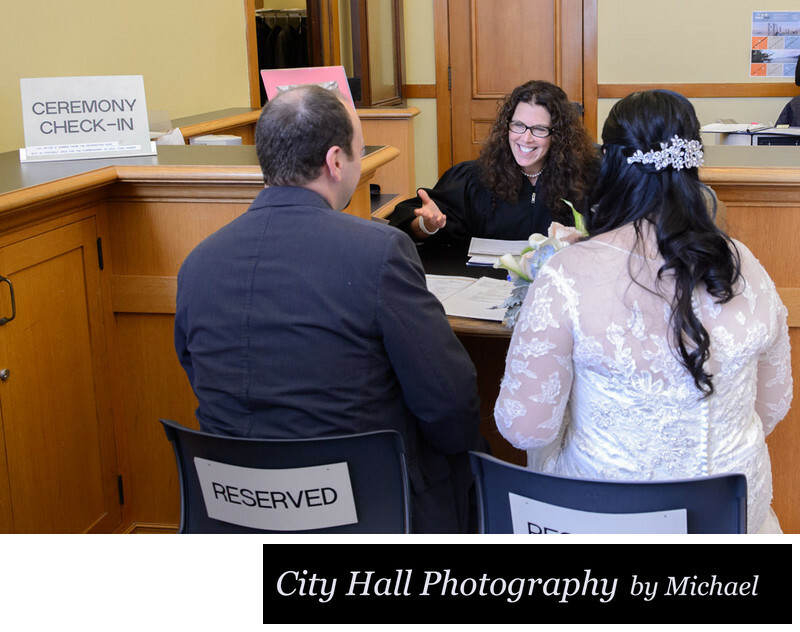 Unlike some civil ceremony venues, SF City Hall allows you to set specific appointments for your marriage license and the actual marriage ceremony. Below is a step-by-step guide and some helpful tips. 1. Step 1: If you have not already obtained your marriage license, you can do it at San Francisco City Hall up to 90 days before your wedding date. The City Hall website has a convenient and easy way to set up this appointment. We personally recommend obtaining your marriage license at least the day before the wedding, but you can actually do it on the same day if it's more convenient. You can set your appointment by clicking here. 2. Step 2: This same link will also allow you to set up your marriage commitment ceremony for the time of your choice. Appointments are available from 9:30 am to 3:30 pm on most week days. Once you have set up both of these appointments and pay your fees, you are ready to go! 3. Step 3: On the day you set your marriage license appointment, be sure to allow plenty of time for parking and the commute to San Francisco City Hall. You will need your current ID's in order to obtain your marriage license. A U.S. Passport will work also, but make sure it is unexpired. 4. Step 4: It's the day of your wedding and you have smartly given yourselves plenty of time to arrive and park at City Hall. Your next step is the famed "ceremony check-in". Depending upon who you talk to at the County Clerk's office, your check-in time is either 5 or 10 minutes before your actual ceremony. Bring your current Identification with you and head to the Clerk's Office (room 168) at City Hall. It's on the 1st floor and relatively easy to find. Once you check-in you will receive your ceremony number and will head out to the hallway to wait for your number to be called. There is no reason to bring your witness in at this time. This is where you will discover that your marriage ceremony isn't actually going to take place at the time you booked! Most weddings occur approximately 15 minutes after you check-in. 5. Step 5: When your number is finally called, you bring your witness and photographer into the County Clerk's office and meet with your Deputy Marriage Commissioner (wedding officiant). At this time, you will be asked some questions regarding preferences for your ceremony including location and ring exchange. They will also want to know what you would like to be called during your nuptials. The only ceremony location choices normally offered are the "private room" and the Rotunda area. Most people choose the beautiful Rotunda and not the tiny room. Once the meeting with the officiant is complete, we all walk up to the Rotunda at City Hall to get married! 6. Step 6: Depending upon how busy it is at city hall, you may be able to request an alternative location. I have found that if you approach your officiant in a sincere and polite way and provide them with a logical explanation as to why you would prefer a different location, you might be rewarded! Don't just say that you want the Mayors Balcony because you have heard it is pretty! At San Francisco City Hall the Mayor's Balcony and the 4th Floor North Gallery are both fantastic alternative locations for your wedding ceremony. It doesn't hurt to ask! 7. Step 7: Once the location of the ceremony is settled on, it is time to start. In most cases, there are 3 weddings every 30 minutes. If your wedding is not the first of the 3, City Hall requests that you wait down the small staircase just below the center Rotunda area. This is out of respect for the other weddings occurring. This is especially important if you have brought a large group with you. Your professional wedding photographer will help point you in the right direction. 8. Step 8: The wedding ceremony takes only about 4 minutes. Some officiants add a few little personalized comments, but in general, you will be married in less than 5 minutes. After the wedding, it is customary to take a posed photograph with the officiant, but this is not required. If your ceremony happened to be one of the first or second ceremonies, it's a nice idea to move out of the area to allow the next wedding to occur with a little bit of privacy. We will help direct you. 9. Step 9: Most wedding photographers will want to do your family and friend photos right after the ceremony. This is the traditional way of photographing a wedding. You have everyone right there and it's certainly more convenient for your guests to not have to wait around for the bride and groom photography to be completed. We always go right into the family shots, complete them, and then excuse the family members so we can take the couple around the building for a beautiful San Francisco City Hall photo tour. If you would like more photos with your guests at other locations, this is the time to tell us. 10. Step 10: Your inside city hall photo tour will usually last about 45 minutes depending upon the package you chose. We encourage our couples to communicate their desires and preferences with regard to their wedding photography session. Comfortable walking shoes are recommended for the bride when strolling around San Francisco city hall. We will allow plenty of time to change shoes before each photo location. Your City Hall Wedding Photographer is here to help! Now that I have put together this long step by step guide to getting married at SF City Hall, I want to make sure that you understand that we are here to help! We feel that our role goes well beyond just taking pictures of the process, ceremony and formal photos. We want to guide you through your whole day and make it as easy as possible for you. Rather than worrying about all the steps above, just let us be your guide. We really enjoy helping our couples and there is an added benefit of creating a more relaxed atmosphere which of course leads to better final images! Our packages are affordable and easy to understand. 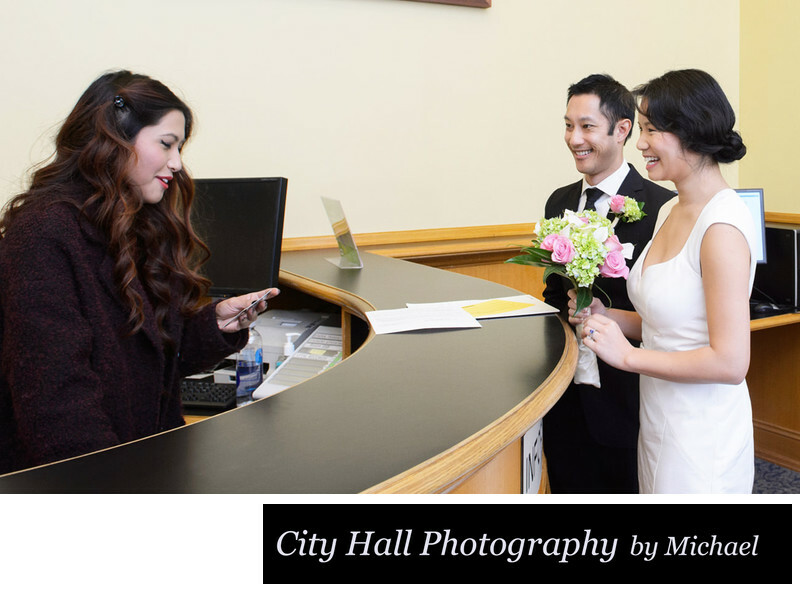 We want to provide you with the best city hall wedding photography in the industry!